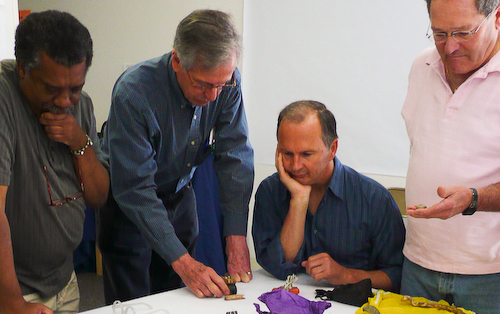 Coaches try KM by the Bay, Berkeley Marina, March 28, 2009 – Geoff Ball, John Ward, Charles Tack, Chance Massaro and Elena DuCharme discuss the debriefing of a model. Seven others participated in the workshop. Coaches can use Kinesthetic Modeling, especially at the beginning of a relationship, to quickly discover the “issues beneath the issues” that their client brings. The surprise factor in the modeling activity disarms the conscious mind. Workshop participants saw how ordinary objects can be more powerful than words; and that the more time people spend mulling over seemingly contradictory images, the greater their opportunity to make new connections. KM deliberately thwarts our conscious mind’s natural tendency to jump to conclusions and actions that only reflect the things that we already know. The session was an opportunity for coaches to literally get their hands on KM and discover the value it can bring to their practices. The shocker for me, came when someone said, “Most of my work with clients is conducted on the phone. How can I possibly use KM in that situation.” I was stumped, exhibiting a perfect case of founder’s blindspot, I said flatly, “I can’t see how”. Chance Massaro didn’t even hesitate. He explained that in his latest most interesting work coaching elders on the phone he often asks them to re-arrange the objects in front of them on the table. “They get a lot out of it; andI don’t need to see the model. I just ask them to tell me what they are now seeing.” The important thing, it turns out, is what the client gets out of the process. I’ve always known that the models are just temporary frameworks for deepening one’s thought processes. But, the old sculptor in me is so secretly enthralled by and attached to the eloquent little worlds that people create when they model that I couldn’t bear not to see them. So now, having taken some of my own medicine I now know: YOU CAN FACILITATE A KINESTHETIC MODELING EXPERIENCE ON THE PHONE. Thanks Chance! KM induces a quiet pondering mind state that is hard to achieve, even in rich dialogue. Here, Vance Williams, Geoff Ball, Charles Tack and Chance Massaro pore over their model. One participant called it, “the glow around the unconscious”.